(CHARLESTOWN,NEVIS–FRIDAY, APRIL 1ST, 2011) Premier of Nevis, the Hon. Joseph Parry hosted a reception in honour of the athletes who will participate in the TriStar 111 Triathlon in Nevis this weekend. The cocktail reception took place on Wednesday at the Mount Nevis Hotel. 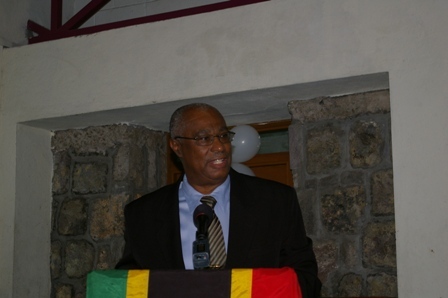 Mr. Parry urged the athletes to return to their countries as ambassadors of Nevis. He asked the athletes to enjoy the cuisine, tour the island at the end of which he was hopeful the visitors would be able to tell their friends about beautiful Nevis. “The Ministry of Tourism is very interested in promoting Sports Tourism,” said the Premier and added his hope that the St. James Drag Raceway would become a huge tourist attraction for the island of Nevis.